Buon giorno and welcome to Stefano’s RomeCabs, Rome’s premier company for private Transfers and Tours in Italy. 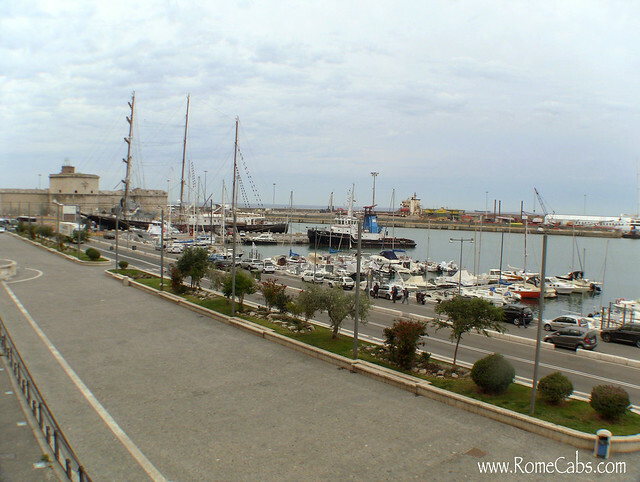 This week’s Video Postcard from RomeCabs features Civitavecchia. Civitavecchia is a lovely seaside port town that sees more than 2 million cruisers and visitors each year, and 2 thousand ships that pass through this historic harbor. Even though it’s about 1.5 hours drive time from Rome, Civitavecchia is considered the Port of Rome…and a very ancient port too! In the name itself. Civitavecchia means “little old town“. In the ancient times of the Romans, the harbor in Civitavecchia was constructed at the start of 2nd century AD by Emperor Trajan. Pliny the Younger (Roman author and magistrate of Ancient Rome), made reference to this port town by the name of Centum Cellae – and some have proposed that it could have referred to the hundred (centum) chambers (cellae) of the Emperor’s villa. After the collapse of the Roman Empire, during the Middle Ages Centumcealle as it was called, became a Byzantine citadel. The Byzantine Empire was also referred toas the Eastern Roman Empire – the continuation of the Roman Empire in the East during late Antiquity and Middle Ages when its capital was Constantinople (modern day Istanbul). In the 9th century it was raided by the Saraceans (Arabs of that era), and then later became part of the Papal States. It wasn’t until late 1690’s that the harbor became a free port and the main port of Rome. It survived occupation by the French Empire and WWII bombings. Today, the main site in Civitavecchia is the imposing fortress: Forte Michelangelo. Renaissance era architect Donao Bramante was commissioned by Pope Julius II to build a fort that would defend Rome from invaders by sea. One part of the “maschio” tower was designed by Michealengelo and the entire fortress went by his name. The town of Civitavecchia is lively with shops, restaurants, cafes and hotels that cater to locals and visitors alike. Many cruisers who arrive late the day before their cruise choose to spend the night in Civitavecchia and leave on their cruise from the nearby port the next day. For more information on Civitavecchia, please click below to read more from our sister blog. Traveling to Italy on a cruise and need Port Transfers, Pre Cruise Tours, Shore Excursions and Post Cruise tours from Civitavecchia? Visit our official website at http://www.RomeCabs.com or click below for more information. Thank you very much or choosing Stefano’s RomeCabs for your Transfers and Tours to/from Civitavecchia. We look forward to welcome you to Italy!